OneCreativeCat: Autumn calls for Peach Pie! Autumn calls for Peach Pie! My neighbor, Wally, gave me some peaches, they looked like they had come from a gift basket, a real nice gift basket! 4 of them in a beautiful box. They were gorgeous peaches! 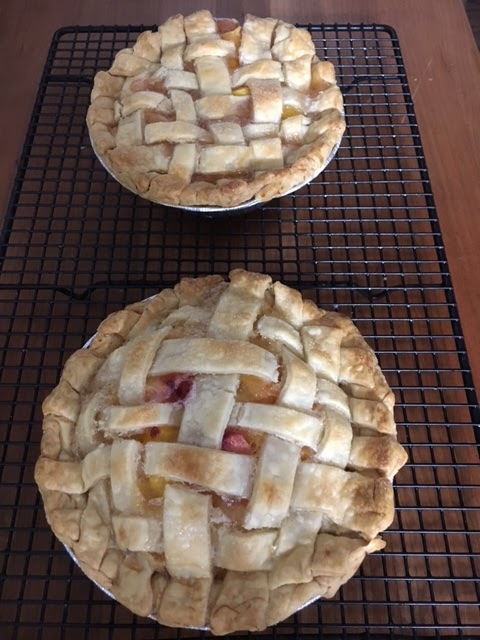 I let them sit out for a couple days to ripen a bit more and then decided to make him and I our own little peach pies! Wally lost his wife of over 50 years this summer, so we have been keeping an eye on him and making sure he is ok, and I have been sending over some home cooked meals once in awhile. He has daughters who come and visit but I still worry. I can't fathom losing my spouse after that many years together! Charlie and I are almost to 30 years married and morning coffee and Sunday naps sure would be missed without him! But on to happier things, Wally is keeping busy and doing great according to him! So on to the peach pie...I went to you tube and my go to chef (chef John of FoodWishes) had the most amazing peach pie recipe. I chose to make mini versions since Charlie does not like peach pie, it would just be a pie for me and one for Wally. You can search you tube for chef John at foodwishes, he has great recipes and I love the way he talks and teaches cooking. But the quick version is this: Slice your peaches and add a sprinkle of salt and 1/2 cup of sugar, mix and let them sit for 1/2 hour, drain the juices only into a pan and cook it on medium until reduced to a thick syrup, set aside. 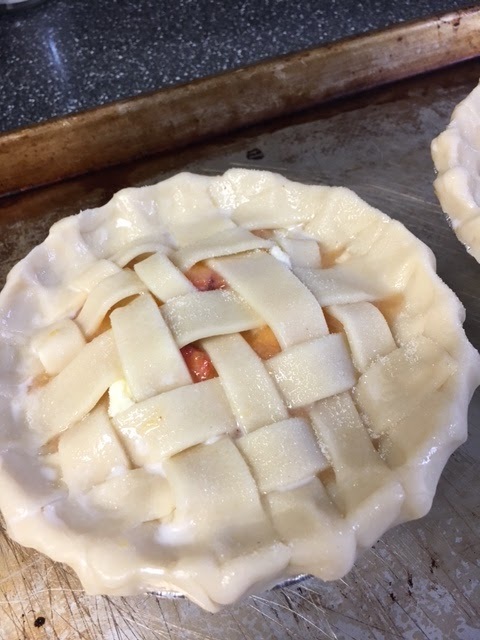 To your peaches add some flour, sugar, a touch of cinnamon, a touch of cornstarch, and the cooked syrup you made, mix well and pour into crust filled pans. You can use homemade crust or pillsbury pie crust. 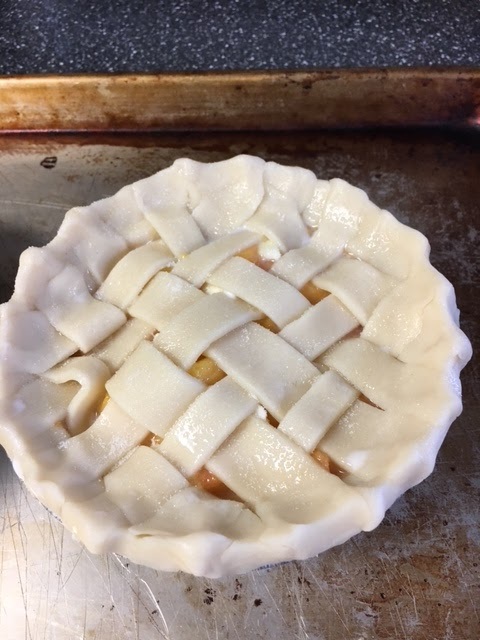 Chef john shows you the easiest way to make lattice topping, My pies looked so wonderful!! But oh man, the flavor was over the top delicious, the secret is that little touch of syrup, I just know it! I have a recipe for Lemon Chicken Romano to share but maybe another time, a cup of coffee and a slice of pie are calling to me!! Looks yummy....So where is my piece?